Do you have those few special recipes that make you feel all warm and fuzzy inside just thinking about them? 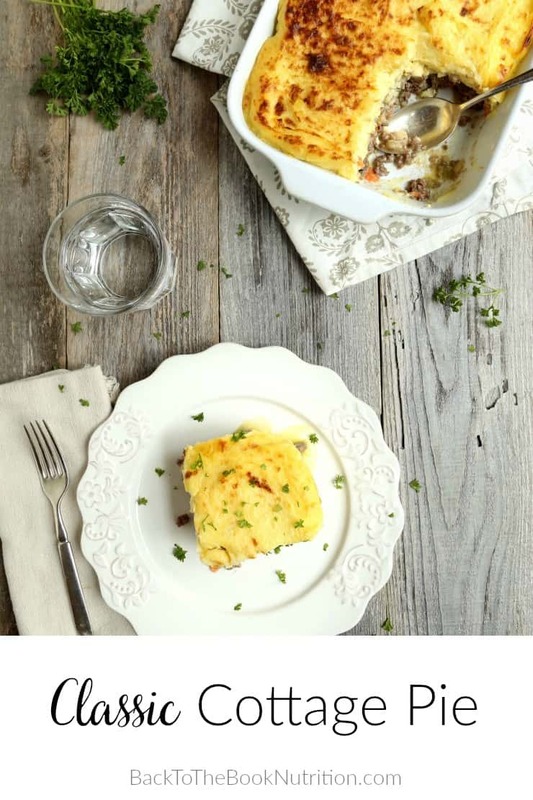 I do, and this Classic Cottage Pie is one of them! It’s simple British comfort food that has found its way across the pond and into my heart! Aside from being completely delicious, I love that this comfort food recipe is made from simple, nourishing whole foods. Start the potatoes and the meat/veggies in two separate pots on the stove at the same time to speed things up. Once those are done, drain the potatoes and mash. I transfer them to a stand mixer, but you can also mash by hand in the same cooking pot after the water is drained. Any type of potatoes can be used for this recipe. Russets are more common in England, but I prefer the buttery taste of Gold potatoes more! Peeling the potatoes is optional. I tend to leave the peels on for added nutritional value, especially if I’m using the thinner skinned Gold potatoes. The flour can be omitted or swapped out for arrowroot powder for a gluten free and grain free option. If you’re using an electric mixer for the mashed potatoes, start on low speed and progress to medium – don’t overmix them or they’ll become gummy! I find that Gold potatoes don’t need much milk/cream, but drier varieties like Russet need more. A variety of veggies can be added – English peas and parsnips are both good options. 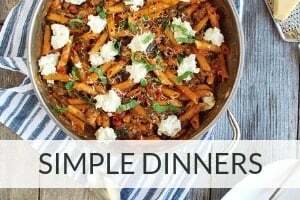 This dish can be assembled in advance and stored in the fridge until ready to cook. 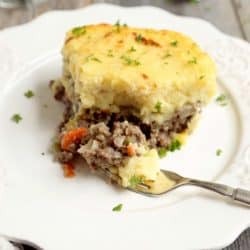 Classic Cottage Pie - this simple English comfort food is one of my all time favorite meals and is a serious crowd pleaser - I get asked for the recipe every time I serve it! It can be made ahead and tastes amazing left over! Place the potatoes in a large pot and cover with water. Bring to a boil over high heat, then reduce to medium high and continue to boil until potatoes are soft (about 10 minutes). While the potatoes are boiling, heat the butter over medium high heat in a large skillet or dutch oven. Add the chopped onion, garlic, celery, carrots, ground beef, salt, and pepper, stirring often until vegetables are soft and meat is browned. Drain the cooked potatoes, add the butter and salt, and use a potato masher or electric mixer to mash. If you're using an electric mixer, start on low speed and progress to medium - don't overmix them or they'll become gummy! Add milk/cream to the potatoes if needed. 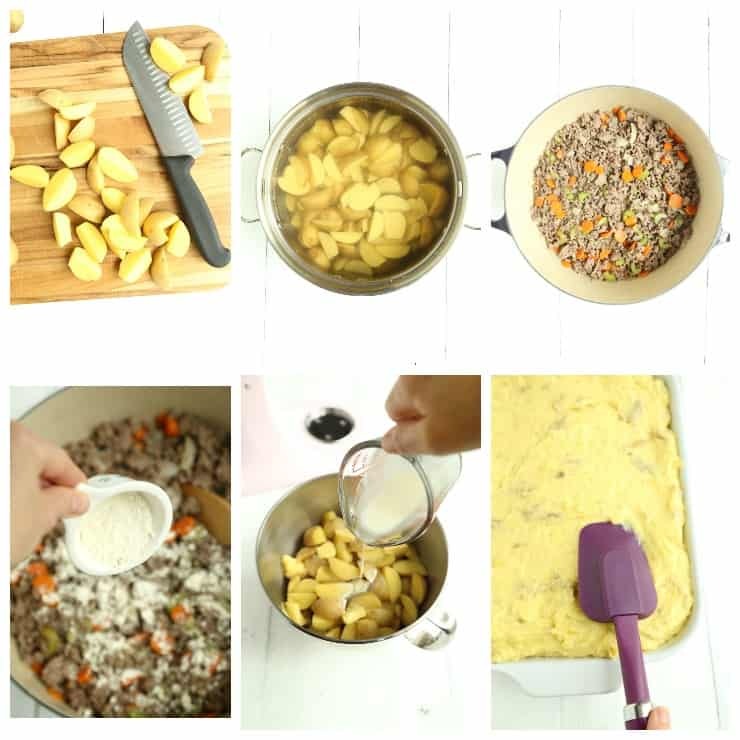 Spoon mashed potatoes on top of the meat-vegetable mixture in the casserole dish and use a spatula to spread evenly across the surface. Bake for 20 minutes, or the mixture is heated through and the surface begins to firm slightly. I usually add a minute or two under the broiler at the end to get that golden brown crisp on the surface! Peeling the potatoes is optional. I tend to leave the peels on for added nutritional value, especially if I'm using the thinner skinned Gold potatoes. 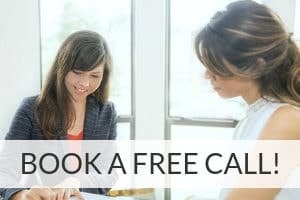 The flour can be omitted or swapped out for arrowroot powder for a grain free/gluten free option. If you're using an electric mixer for the mashed potatoes, start on low speed and progress to medium - don't overmix them or they'll become gummy! I find that Gold potatoes don't need much milk/cream, but drier varieties like Russet need more. A variety of veggies can be added - English peas and parsnips are both good options. I simply LOVE cottage pie! Whenever I make it for friends here in Italy I always get so many compliments! Goes to show there are some great British recipes! And yes, leftover cottage pie is amazing too! This looks soo delicious and super healthy too with no unhealthy addons , exactly how I love it! Great inspirational dish, thanks for sharing. Being a Londoner, I appreciate a good cottage pie and this looks delicious! Thank you! We definitely had some great eats in the London pubs! You had me at butter! 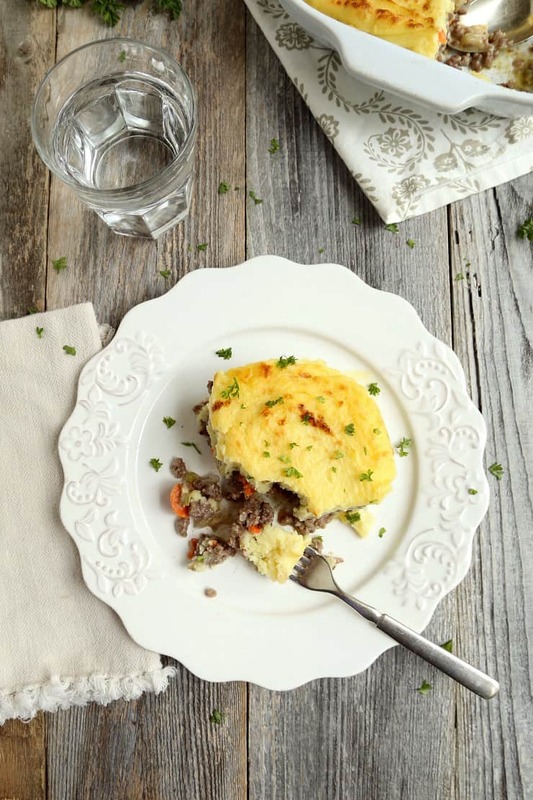 This Cottage Pie does look like the PERFECT comfort food. This is definitely a dish that I would go back for seconds. This will be a perfect Sunday dinner in my home. I am saving it to make soon. Great! Hope you love it as much as we do, Katie! I haven’t heard this called cottage pie. I’ve always heard shepherd’s pie! But either name this looks delicious! I would love the addition of parsnips! 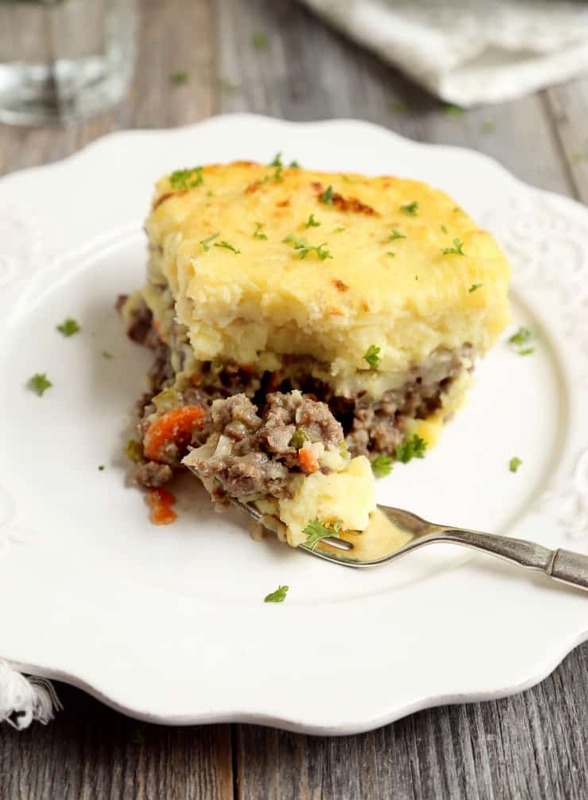 I’ve been craving shepherd’s pie for a while now, and this looks pretty similar! Maybe I even prefer it more, as lamb often has a strange taste. I love that buttery layer of potatoes, looks absolutely delicious and very comforting. Perfect for the colder months! 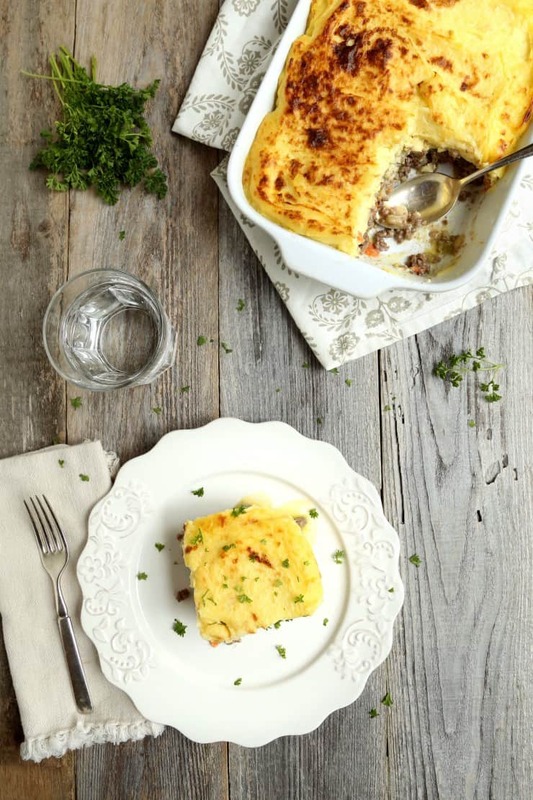 This looks delicious and such great comfort food for this cooler weather! Love the idea of using parsnips!